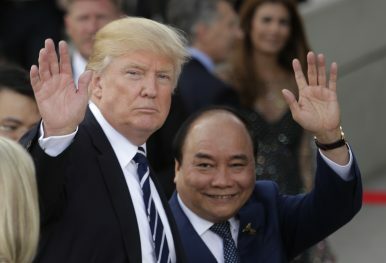 U.S. President Donald Trump, left, and Vietnamese Prime Minister Nguyen Xuan Phuc wave prior to a concert on the first day of the G-20 summit in Hamburg, northern Germany (July 7, 2017). When U.S. President Donald Trump touches down in Hanoi on November 11 for a state visit, he will be received by a government eager for his engagement. Sandwiched between trips to Beijing and Manila, which are both run by leaders wary of U.S. policy in the Asia-Pacific, Trump’s Hanoi visit will be met by local concerns that Washington is not doing enough in the region under the new administration. The week will not be entirely dominated by the Trump. World leaders will gather in Da Nang the day before the state visit for APEC’s annual leader summit, where Trump will be joined by Chinese President Xi Jinping, Russia’s Vladimir Putin, and Japan’s Shinzo Abe among other heads of government from the Pacific Rim. Xi, whose power within the Communist Party of China was consolidated at the Party Congress in October, also plans to make a state visit to Vietnam following the conclusion of the APEC summit in Da Nang. All eyes in the country are on the two state visits as Vietnam, nestled precariously close to its historic foe to the north, aims to leverage the two powers to maintain its long standing commitment to nonalignment. “The official visit of President Donald Trump in Hanoi is important for Vietnam to keep a balance in power in the region, considering the rising power of China after the 19th Party Congress of the Communist Party of China,” said Le Dang Doanh, a former senior economic advisor to the government and member of the Communist Party of Vietnam. Nguyen Quang A, a retired businessman and former party member turned dissident activist, said that despite domestic Vietnam’s human rights record, of which he is a vocal critic, it was in everyone’s interest for Hanoi and Washington to nurture their relationship as Beijing grows bolder. “We have had experience for a long, long, long time… we have to resist [China’s] expansion policy, and I think that if Vietnam can have the support of the others – the Japanese, Americans – that would be good,” said Quang A. He has concerns, however, that Trump may be less committed to the bilateral relationship. “We worry that Trump’s policies are not very clever, and because he is a businessman his policies can be influenced by business mentality, trade-offs, and so on,” said Quang A, adding that he feared Vietnam would be used as a chess piece by Trump to advance an agenda unconcerned with the Southeast Asian country’s future. “Vietnam has been sold several [times] by the others, so we have to worry about tragic possibilities,” he added. Vietnamese animosity toward China dates back to antiquity. Northern Vietnam was first colonized by the Han Dynasty in the second century BCE and, save for a few brief interruptions, was continuously occupied by China for a millennium. The Ming Dynasty later tried to again conquer Vietnam, although it was unable to hold the country longer than a few decades. The legends of anti-Chinese resistance run deep in Vietnam, with city streets throughout the country carrying the same names of heroes from the imperial wars. Memories from the most recent border war in 1979, which killed tens of thousands on both sides in the space of just one month, still run deep, and the ongoing dispute over islands in the South China Sea is seen as a continuation of an eternal rivalry. China claims almost all of the South China Sea, including sections of Vietnam’s internationally recognized exclusive economic zone thought to be rich with fossil fuel resources. Mistrust of China is the rule in Vietnam, explained Quang A. “[Xi] always tells the world that they develop peacefully, they don’t try to harm anybody, but with the Chinese relationship, you have to understand on the whole. You have to be careful with what they say, because what they say or said was very, very, good, but the real action is quite the opposite,” he said. Still, a degree of friendliness toward Beijing, said Quang A, is necessary out of geographical practicalities. “On the one hand, China is here, it’s our neighbor. You cannot move Vietnam somewhere, so we have to have good relations with China,” he said. “But at the same time we have to resist its actions on the South China Sea, and maybe not only on the sea, in the mainland, too,” he added. The United States, in contrast, enjoys one of its highest public approval ratings worldwide in Vietnam, with 84 percent having confidence in the country according to a Pew poll published in June 2017. And while citizens of most countries have little nice to say about the United States’ firebrand commander-in-chief, the same survey found Vietnam tied in second place for the country with most confidence in Trump at 58 percent. Strong relations with Vietnam are also popular within Washington’s beltway, where support for Hanoi has met little resistance in the 21st century. Michael Mazza, a visiting fellow at the American Enterprise Institute think tank in Washington and an Asia-Pacific defense policy specialist, said U.S. interests were on the side of a cooperative relationship with Vietnam. “A robust bilateral relationship has the potential to increase prosperity for both countries, facilitate U.S. power projection in the region, deter Chinese bad behavior, and, generally speaking, shape a Southeast Asia and broader Asia-Pacific conducive to American interests,” he said. Memories from the Vietnam War, he added, have not proved particularly pertinent in contemporary relations, apart from cooperation over searching for the bodies of American soldiers and Agent Orange cleanup. “I think it’s difficult to overstate how far the bilateral has come. Put simply, the United States and Vietnam have gone from two countries at war to two countries cooperating to maintain peace and order in the South China Sea,” said Mazza. As Vietnam seeks to balance relations with China and the United States, observers in both Washington and Hanoi are keen to gauge how interested Trump is in maintaining America’s side of the scales. The death of the Trans-Pacific Partnership, which Vietnam had eagerly awaited, created widespread confusion and dismay in Hanoi. Vietnam is also closely watching the number of U.S. Navy Freedom of Navigation Operations (FONOPs) challenging Chinese claims in the South China Sea, which got off to a slow start under the Trump administration. Mazza said apart from TPP, of which Vietnam had been an eager signatory, there is reason to suspect that the Obama administration’s policies toward Vietnam, which mostly had bipartisan support, are carrying over into the Trump era. He cited the visit of Prime Minister Nguyen Xuan Phuc in May to the White House. “The joint statement’s paragraph on the South China Sea, moreover, suggested an alignment of U.S. and Vietnamese outlooks and approaches to this particular challenge to and to international law,” Mazza said, adding that the statement also raised the possibility of the first aircraft carrier visit to Vietnam since the end of the war. Mazza also said, however, that there was concern that Trump’s focus on North Korea was distracting the administration from the South China Sea, thus possibly opening opportunities for China. “We saw this in the spring, when the White House apparently forewent freedom of navigation operations for a few months while it sought Beijing’s assistance with North Korea,” he said, adding that the operations seem to be back on. “That being said, the United States seems to have returned to regularly scheduled FONOPs in the South China Sea and there has been consistent high-level engagement with Southeast Asian leaders over the past six months or so,” he added. Carlyle Thayer, a Southeast Asia expert and Emeritus Professor at the University of New South Wales, said that Vietnam was “quick off the mark” following Trump’s inauguration to get into the president’s good graces by appealing to Trump’s business sense. “Vietnam pushed all the right buttons. During Prime Minster Phuc’s visit business deals worth several billions of dollars were signed, Vietnam agreed to negotiate a free trade agreement with the United States, and Vietnam agreed to improve investment opportunities for American companies, and protect and enforce U.S. intellectual property rights,” said Thayer. Vietnam, however, limits its own ability to get too close to the US. It abides by its “three nos”; no military alliances, no foreign bases, and no letting one country use Vietnam to harm another. But Doanh says those rules may be changed to suit the shifting realities of the 21st century. “So far it is the official line of Vietnam, but I think time is changing very much, and I strongly support a new concept that Vietnam will try to seek the alliance with friendly countries to defend its territorial integrity and to defend its national interests from any hostile attack from the outside,” he said, without specifically naming any other country as a potential ally. Bennett Murray is Deutsche Presse-Agentur’s Hanoi bureau chief. Follow him on Twitter @BDMurray.